Name is pronounced "day-OH-lis"...Graduated from La California High School in San Felix, Venezuela...Follow him on Twitter (@deolisguerra). Pitched for Magallanes in the Venezuelan Winter League during each offseason from 2008-18, posting a 1.57 ERA this past winter (27 games) ...Signed as a free agent with Texas on 1/16...Signed as a free agent with Milwaukee on 12/8. Appeared in 19 games over 2 stints with the Angels (4/14-6/3; 9/5-end of season)…issued runs 7 times and permitted 4 of 19 first batters to reach base…allow one of 5 IR to score…opposition batted .217, .200 vs. RHB and .234 vs. LHB… held opposition to a .217 (5-23) average with runners in scoring position…was purchased from Salt Lake on 4/14 and posted a 5.66 ERA (13 ER/20.2 IP) in 15 games…earned wins in back-toback outings, 4/28 at TEX and 5/2 at SEA…was designated for assignment on 6/3 and outrighted to Salt Lake on 6/6…rejoined the Angels on 9/5 and pitched 4.1 scoreless innings in 4 games the rest of the way. 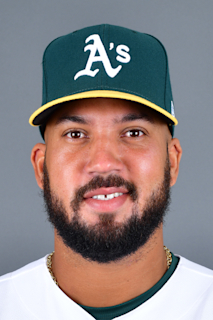 Surrendered runs in 6 of 31 games at Salt Lake with 2 saves in 4 tries…allowed 4 runs in 1.1 IP on 8/22 vs. Las Vegas with a 1.14 ERA (5 ER/39.1 IP) in his other 30 appearances…pitched for Team Venezuela in 2017 World Baseball Classic, issuing 5 ER in 3.1 IP over 4 outings…did not retire a batter while allowing 4 runs on 3/10 vs. Puerto Rico before allowing one run in 3.1 IP in last 3 appearances…was 0-2, 4.15 (4 ER/8.2 IP) in 8 games with Magallanes in Venezuelan Winter League. Was selected by LAA in MLB Rule 5 Draft on 12/10/15…was assigned outright to Salt Lake on 3/26 after clearing waivers…underwent emergency appendectomy during final week of spring training…was purchased by LAA on 5/21 and was with the Angels for all but 5 days (5/30-6/3) the rest of the season…issued 4 runs in 2.1 IP in 2nd outing on 5/25 at TEX, then had a 2.70 ERA in last 42 games…did not walk a batter over first 16 appearances (24.1 IP), 5/22-7/5 and ranked among 3rd ML relievers (min. 50.0 IP) with just 1.18 BB per 9.0 IP…opposition hit .249…had 5 holds. Began season with Triple-A Indianapolis. Picked up first win in second outing April 12 vs. Columbus... Pitched three scoreless innings to earn first save of season and third of his professional career April 25 at Toledo... Posted his second three-inning save May 25 at Buffalo. Had contract selected by Pittsburgh on June 26... Went 2-1 with four saves and a 1.23 ERA (36.2 IP - 5 ER) in 25 games with Indianapolis. Ranked third among International League relievers with a .165 (21/127) batting average against at the ti me of his promotion to Pirates... Did not surrender a run in 11 straight Triple-A games (13.2 IP) between May 25 and June 24 and was scored upon in just three of his 25 outings to start season. Made Major League debut June 27 and tossed one scoreless inning vs. Atlanta. Pitched three scoreless innings and picked up his first Major League win in Pittsburgh's 14-inning victory June 30 at Detroit. Retired all six San Diego batters he faced to earn second big league win July 8. Grounded out in first plate appearance of professional career July 11 vs. St. Louis. Was designated for assignment by Pittsburgh July 31... Was claimed off waivers by Cleveland August 5, but was returned to Pirates August 7 and was placed on 15-day disabled list with left knee inflammation... Transferred to 60-day D.L. September 2. Pitched with Magallanes in Venezuelan Winter League during offseason. Was an invite to Twins spring training...trained with Team Venezuela in the World Baseball Classic but did not pitch after being diagnosed with a blood clot in right shoulder; had surgery to remove a rib, improving the circulation in right shoulder…Pitched in three games with GCL Twins on rehab assignment August 20-27. Began season with Double-A New Britain, going 2-0, 0.71 (12.2 IP, 1 ER) in seven games and was promoted to Triple-A Rochester April 28. ... Placed on the 7-day disabled list with right shoulder tendinitis July 3-25, missing 20 games. ... Recorded at least one strikeout in 15 straight appearances (28 total) May 17-July 29. ... Tied for third on Red Wings staff in strikeouts (56) and tied for fifth in games (29). ... Struck out multiple batters in 18 of 29 appearances and three-plus batters in eight appearances for the Red Wings. ... Ranked as having best changeup in Twins system by Baseball America entering the 2013 season. ... Named to 2013 Venezuela roster for World Baseball Classic. Spent the season with Double-A New Britain...began the season as a starter, going 3-5, 9.00 (43.0 ip, 43 er) in 10 starts...went 5-2, 2.77(52.0 ip, 16 er) with one save in 27 relief appearances...Went 2-0, 1.29 (21.0 ip, 3 er) in 10 August games...earned his first professional save, with 1.0 scoreless inning, August 20 vs. New Hampshire...Named Twins Minor League Pitcher of the Month for August after going 2-0, 1.29 (21.0 ip, 3 er) with 23 strikeouts and five walks in 10 games...Placed on the 7-day disabled list with a right biceps strain, September 3 and did not return...Ranked second on the Rock Cats staff in strikeouts...struck out at least one batter in 34 of his 37 appearances and struck out multiplebatters in 28 appearances...Pitched for Navegantes del Magallanes in the Venezuelan Winter League following the season...Rated Best Changeup in the Twins' minor league system by Baseball America, entering the 2012 season. Started the season at Double-A New Britain...lost his first start, allowing five runs (four earned) on six hits in 5.0 innings, April 12 vs. Portland...Won in his second start, allowing two runs on six hits in 6.0 innings, with no walks and four strikeouts...did not walk a batter in his firstthree outings (18.0 ip), April 12-22...Went 1-1, 3.07 (29.1 ip, 10 er) with four walks and 21 strikeouts in his first five starts...promoted to Triple-A Rochester, May 10...Made five appearances (four starts), going 0-3, 6.84 ERA (25.0 ip, 19 er) with eight walks and 19 strikeouts for the Red Wings...wastransferred to New Britain, June 5...Tossed an 8.0-inning complete game in his first start back with the Rock Cats, June 9 at Richmond...allowed two runs (none earned) onthree hits but suffered the loss...Earned his second and final win of the season, tossing 7.0 shutout innings allowing four hits, July 1 at New Hampshire...Placed on the disabled list with a left oblique strain, missing the rest of the season, August 26...Pitched in the Venezuelan Winter League for Navegantes del Magallanes, going 2-1, 3.12 (43.1 ip, 15 er) with 36 strikeouts and five walksin nine games (seven starts). Began season at Single-A Ft. Myers...recorded first win, April 15 vs. Jupiter, allowing three hits in 5.0 shutout innings...named Florida State League Pitcher of the Week for June 29...promoted to Double-A New Britain, July 7...won his first game with the Rock Cats in his first start, July 8 vs. Connecticut...named Eastern League Player of the Week, July 20...named Twins' Minor League Player of the Week on July 24, going 2-0, 2.03 (13.1 ip, 3 er) with 15 strikeouts and eight hits allowed in two starts, including a complete game shutout with 12 strikeouts, July 23 vs. Portland...his 12 combined wins and 149.0 innings pitched were both third in the Twins minor league system...ranked as having the best changeup in the Twins' system by Baseball America...played in the Venezuelan Winter League with Navegantes del Magallanes, going 2-0, 5.63 (16.0 ip, 10 er) in four games (three starts). Spent entire season at Single-A Ft. Myers after being acquired in a trade with the New York Mets in the offseason (February 2), along with pitchers Kevin Mulvey and Philip Humber and outfielder Carlos Gomez, in exchange for pitcher Johan Santana...allowed just one run on 10 hitsin his first three outings (15.0 ip)...won four straight games, May 8-29...tossed a complete game shutout, July 1 vs. Tampa, allowing just three hits earning the win...tossed 6.1 shutout innings, July 11, allowing five hits while earning the win...held right-handers to a .230 batting average while lefties batted .327...led the club in wins (11), innings pitched (130.0) and strikeouts (71)...ranked fourth in the Florida State League in wins...ranked best changeup in the Twins minor league system by Baseball America. Spent entire season at Single-A St. Lucie of the Florida State League...made his first start, April 5 vs. Vero Beach and tossed 5.0 shutoutinnings...earned his first win of the season with 6.0 shutout innings, April 23 at Jupiter...posted a 2.18 ERA (20.2 ip, 5 er) over his first four starts...struck out a season-high of seven batters in 5.2 innings, May 3...pitched for the World Team in the Major League Baseball Futures Game, July 8 at San Francisco...made one appearance in relief, allowing four runs (two earned) in 1.1 innings, August 8...posted a 2.89 ERA over his final five appearances...held righthanded batters to a .228 (44-for-193) batting average with 37 strikeouts...was ranked as the Mets' second-best prosepct by Baseball America entering the 2008 season. Started his professional career in the South Atlantic League with Single-A Hagerstown...won his first game, June 8 as he allowed just one run on four hits over 5.0 innings...named Pitcher of the Week, July 24-30 after going 2-0, with a 0.52 ERA (17.1 ip, 1 er)...made three starts in August posting a 1.15 ERA before being promoted to Single-A St. Lucie...made two starts for St. Lucie, including winning his last start of theseason, tossing 5.0 innings allowing just one earned run, September 2 vs. Vero Beach. December 10, 2018 Milwaukee Brewers signed free agent RHP Deolis Guerra to a minor league contract and invited him to spring training. December 10, 2018 RHP Deolis Guerra assigned to San Antonio Missions. November 2, 2018 RHP Deolis Guerra elected free agency. April 5, 2018 Deolis Guerra assigned to Round Rock Express. January 29, 2018 RHP Deolis Guerra assigned to Round Rock Express. January 20, 2018 Texas Rangers signed free agent RHP Deolis Guerra to a minor league contract and invited him to spring training. December 1, 2017 RHP Deolis Guerra assigned to Navegantes del Magallanes. November 6, 2017 RHP Deolis Guerra elected free agency. November 3, 2017 Los Angeles Angels sent RHP Deolis Guerra outright to Salt Lake Bees. September 5, 2017 Los Angeles Angels selected the contract of RHP Deolis Guerra from Salt Lake Bees. June 6, 2017 Los Angeles Angels sent RHP Deolis Guerra outright to Salt Lake Bees. June 3, 2017 Los Angeles Angels designated RHP Deolis Guerra for assignment. April 14, 2017 Los Angeles Angels selected the contract of RHP Deolis Guerra from Salt Lake Bees. February 15, 2017 Los Angeles Angels sent RHP Deolis Guerra outright to Salt Lake Bees. February 15, 2017 Los Angeles Angels invited non-roster RHP Deolis Guerra to spring training. February 10, 2017 Los Angeles Angels designated RHP Deolis Guerra for assignment. November 12, 2016 RHP Deolis Guerra assigned to Navegantes del Magallanes. June 4, 2016 Los Angeles Angels selected the contract of RHP Deolis Guerra from Salt Lake Bees. June 2, 2016 Los Angeles Angels sent RHP Deolis Guerra outright to Salt Lake Bees. May 30, 2016 Los Angeles Angels designated RHP Deolis Guerra for assignment. May 21, 2016 Los Angeles Angels selected the contract of RHP Deolis Guerra from Salt Lake Bees. May 6, 2016 Salt Lake Bees activated RHP Deolis Guerra from the 7-day disabled list. April 7, 2016 RHP Deolis Guerra assigned to Salt Lake Bees. March 26, 2016 Los Angeles Angels signed free agent RHP Deolis Guerra to a minor league contract. March 25, 2016 Los Angeles Angels sent RHP Deolis Guerra outright to Salt Lake Bees. December 10, 2015 Los Angeles Angels claimed RHP Deolis Guerra off waivers from Pittsburgh Pirates. December 7, 2015 Pittsburgh Pirates signed free agent RHP Deolis Guerra to a minor league contract and invited him to spring training. November 22, 2015 Navegantes del Magallanes signed free agent RHP Deolis Guerra. October 27, 2015 RHP Deolis Guerra elected free agency. October 22, 2015 Pittsburgh Pirates sent RHP Deolis Guerra outright to Indianapolis Indians. July 31, 2015 Pittsburgh Pirates designated RHP Deolis Guerra for assignment. June 26, 2015 Pittsburgh Pirates selected the contract of RHP Deolis Guerra from Indianapolis Indians. April 9, 2015 RHP Deolis Guerra assigned to Indianapolis Indians. November 18, 2014 Pittsburgh Pirates signed free agent RHP Deolis Guerra to a minor league contract and invited him to spring training. October 7, 2014 RHP Deolis Guerra assigned to Navegantes del Magallanes. May 5, 2014 Rochester Red Wings activated RHP Deolis Guerra from the 7-day disabled list. April 18, 2014 Rochester Red Wings placed RHP Deolis Guerra on the 7-day disabled list. Strained right hamstring. March 30, 2014 RHP Deolis Guerra assigned to Rochester Red Wings. January 31, 2014 RHP Deolis Guerra assigned to Venezuela. November 20, 2013 Minnesota Twins signed free agent RHP Deolis Guerra to a minor league contract and invited him to spring training. November 4, 2013 RHP Deolis Guerra elected free agency. September 13, 2013 Rochester Red Wings activated RHP Deolis Guerra from the 7-day disabled list. August 20, 2013 Rochester Red Wings sent RHP Deolis Guerra on a rehab assignment to GCL Twins. April 2, 2013 Rochester Red Wings placed RHP Deolis Guerra on the 7-day disabled list. November 30, 2012 Minnesota Twins sent RHP Deolis Guerra outright to Rochester Red Wings. October 4, 2012 Minnesota Twins recalled Deolis Guerra from Rochester Red Wings. July 26, 2012 Deolis Guerra roster status changed by Rochester Red Wings. July 6, 2012 Rochester Red Wings placed RHP Deolis Guerra on the 7-day disabled list. April 28, 2012 RHP Deolis Guerra assigned to Rochester Red Wings from New Britain Rock Cats. March 29, 2012 Deolis Guerra assigned to New Britain Rock Cats from Rochester Red Wings. March 15, 2012 Minnesota Twins optioned Deolis Guerra to Rochester Red Wings. October 6, 2011 Deolis Guerra roster status changed by Minnesota Twins. March 14, 2011 Minnesota Twins optioned RHP Deolis Guerra to New Britain Rock Cats. October 13, 2010 Deolis Guerra roster status changed by Minnesota Twins. August 26, 2010 Deolis Guerra roster status changed by New Britain Rock Cats. June 5, 2010 RHP Deolis Guerra assigned to New Britain Rock Cats from Rochester Red Wings. May 10, 2010 Deolis Guerra assigned to Rochester Red Wings from New Britain Rock Cats. March 14, 2010 Minnesota Twins optioned Deolis Guerra to New Britain Rock Cats. November 20, 2009 Minnesota Twins selected the contract of Deolis Guerra from New Britain Rock Cats. October 7, 2009 RHP Deolis Guerra assigned to Navegantes del Magallanes. July 7, 2009 Deolis Guerra assigned to New Britain Rock Cats from Fort Myers Miracle. July 2, 2005 New York Mets signed free agent RHP Deolis Guerra to a minor league contract.